5 Ways the Trump Administration Is a Disaster for Science – When Scott Pruitt, Trump’s Environmental Protection Agency chief, misrepresented the well-established link between human activity and global warming this spring, newly minted EPA spokesperson Liz Bowman jumped to his defense. “Administrator Pruitt makes no apologies for having a candid dialogue about climate science,” she told reporters. Until days prior, Bowman had worked for the American Chemistry Council, a trade group that’s long worked to undermine the EPA’s authority to protect the public, while Pruitt sued the EPA 13 times as Oklahoma’s attorney general, allowing fossil fuel company executives to draft letters he sent on state letterhead protesting EPA’s authority to regulate methane. Bowman and Pruitt are just two individuals in what’s become a torrent of Trump appointees whose primary qualification is a history of attacking the very agencies they now lead. When industry lobbyists and fringe ideologues storm the castle, the censorship and manipulation of science becomes considerably more likely, and the need for watchdogs to keep government officials honest becomes ever more critical. The last six months were a disaster for the role of evidence in policy decisions. The Trump administration systematically abandoned science-based public protections, avoided scientific and technical review of its policy priorities, reduced public access to scientific information and compromised the independence of science advisory committees. As a result, Americans are more vulnerable to public health and environmental threats. Here are several ways the administration is systematically – and often quietly – weakening science in America. Science is being removed from decision-making. Left unchecked, there will always be companies that skirt the rules at the public’s expense. In response, Congress created bipartisan laws grounded in science to allow for economic growth while protecting public health and safety, and empowered federal agencies to carry them out. The EPA implements the Clean Air Act, which is why kids aren’t regularly kept indoors because of excessive smog. The Food and Drug Administration does its best to keep the food supply safe and ensure we don’t die from unsafe drugs or quack medical devices. The Consumer Product Safety Commission protects American families from lead-tainted toys. Public protection laws are effective because they require the government to justify – or remove – public protections with the best available science. When this threshold is not met, the courts step in. Some lawyers are even counseling industry clients to pay for analysis that understaffed agencies can use to tilt the scales in their favor. One can only assume they will find a willing audience. We’re relying on lobbyists to protect children from brain damage. A wealth of studies show that chlorpyrifos, a heavily used pesticide manufactured by Dow, harms developing human brains. EPA scientists and the American Academy of Pediatrics have urged the EPA to ban it. But Dow CEO Andrew Liviris leads the administration’s anti-regulatory task force, and Dow lawyers asked the EPA in April to reject the scientists’ advice. Administrator Pruitt listened. According to multiple EPA sources, the scientists who worked on the issue were never consulted and learned about the decision through the news. The reduction of unwanted teen pregnancies is being hampered. Attacks on science go far beyond environmental agencies. And the direct consequences for public health and safety are profound. A senior official at the Department of Health and Human Services believes contraception doesn’t work. “Human reproduction has become the victim of alternative science, rife with alternative definitions of well-understood medical conditions and characterized by rejection of the scientific method as the standard for generating and evaluating evidence,” bioethicist Alta Charo wrote in a recent New England Journal of Medicine editorial excoriating the administration for a slew of bad public-health picks. In early July, the administration abruptly cut $213 million in teen pregnancy prevention research grants halfway through a five-year project. The move makes two years of research useless, and jeopardizes the progress the United States has made toward reducing rates of unwanted teen pregnancies. “Public health issues shouldn’t be political issues,” Pat Paluzzi of Baltimore’s Healthy Teen Network told the Center for Investigative Reporting of the move. Political appointees are sabotaging their own agencies. Agency leaders typically argue for budgets that will allow them to carry out their mission. In the Trump era, that’s no longer necessarily the case. Acting Indian Health Service Director Michael Weahkee acknowledged earlier this month that staffing was his biggest challenge, but then refused to acknowledge in a Senate hearing that the proposed Trump budget would decrease funding for workforce development in his agency. Under that proposed budget, agencies also would be forced to drastically reduce data collection on everything from water pollution to nuclear power plant safety to the spread of diseases. This information is critical to the ability of state and local governments and university researchers to understand and address public health and environmental threats. Even Republican legislators who have long been critical of the EPA challenged the administration’s proposed cuts to scientific initiatives. The sabotage goes well beyond budgets. Last year, after 42 years of analysis and debate, the Occupational Safety and Health Administration finalized a science-based rule to protect workers from exposure to toxic silica dust. In April, the Trump administration delayed implementation of the safeguard. Is four decades not enough time for construction companies to adjust their practices? The administration also delayed rules protecting shipyard workers from beryllium exposure, requiring food companies to tell the public how much sugar is added to products, limiting methane emissions and implementing energy-efficiency standards. Each of these rules took years of careful analysis and incorporated many rounds of public input. The EPA even postponed a rule that would give first responders information about hazardous chemicals stored at chemical facilities. This must be cold comfort to the families of the 12 first responders killed after a Texas fertilizer plant explosion in 2013. And forget any oversight: President Trump wants to eliminate the Chemical Safety Board, which investigates chemical disasters. Independent science advice is being dismantled. Tens of thousands of experts volunteer their time on hundreds of federal science advisory committees to inform the decisions of government officials. In the Trump era, science advice to government is grinding to a halt. The Department of the Interior suspended advisory committee activity, making it harder for the government to conserve endangered species and safeguard national monuments from climate change. The Department of Justice disbanded a key committee charged with improving the reliability of forensic sciences, stacking the deck in favor of prosecutors and unnecessarily putting more people at risk of false imprisonment. The EPA ejected a majority of the scientists from its Board of Scientific Counselors, and is expected to fill their positions with others who are on the industry dime. Meanwhile, the president’s sham Electoral Integrity Commission may have violated federal law and seems destined to create yet more misinformation about vulnerabilities in the U.S. election system. This pattern also can be seen outside the science realm: The president believes his son-in-law, armed with extensive real estate development experience, will solve the Israeli-Palestinian conflict. His administration has attempted to delegitimize analysis from the nonpartisan Congressional Budget Office, national intelligence agencies and the judiciary. In Trump’s world, any independent expertise should be neutralized. 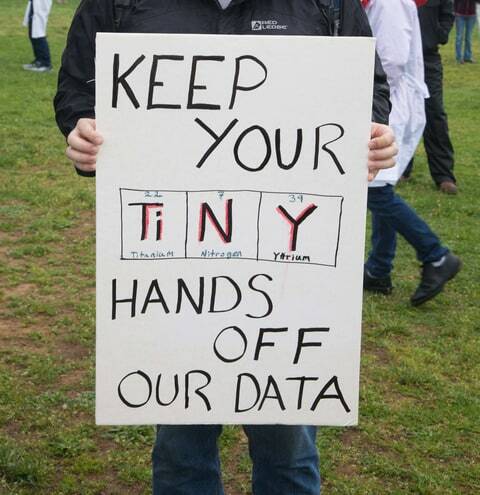 But scientists are standing their ground. Science supporters around the globe are not taking these attacks lying down. The Data Refuge Project and Internet Archive have preserved thousands of scientific datasets and agency websites. Independent scientists have slammed the administration and detailed the impact of its proposed cuts to scientific initiatives. The saving grace is that Americans across the political spectrum continue to trust scientists to benefit our health, our economy and our lives. It’s up to the science community to document and communicate how the Trump presidency puts this legacy at risk. And there’s never been a more important time to speak out for science and the public interest.